I have mentioned last week that there are 2 Enterprise Reports to watch out for this week. 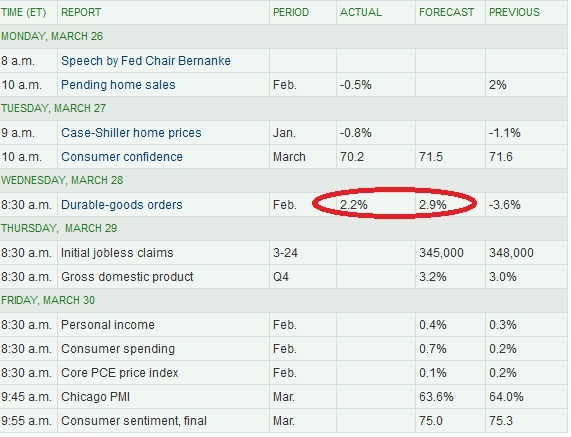 One of them is this Friday Chicago PMI, the other is today's Durable goods Report. 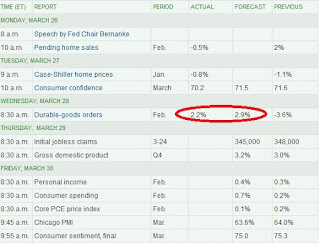 Today Durable Goods Report is a dissapointing 2.2% compared to forecast of 2.9%. That is one major reason why Dow is down by 80 points by noon. But the main one this week is still Friday's Chicago PMI. Today I am looking at opportunities, but did not enter. Almost all stocks are dragged down by the report. But Google broke through of $650 to reach $658. It has potential to run, but because of the major market, it is down a bit by midday. Potential to run when market turns better. Amazon takes a turn to test $200 support. See whether it lifts off this support! Great entry also if it does.